Stay with WARR online and follow D & D on Twitter to get the latest on all show developments. — ed. Coming out of this past momentous sports weekend, its clear that most folks were left disappointed by Saturday’s main course — the long-awaited meeting of Floyd Mayweather Jr. and Manny Pacquiao in a boxing ring in Las Vegas. Most of us, unless you consider yourself an ancillary member of The Money Team (meaning — you get all the pride of a “Money” Mayweather win but none of the financial perks…unless your name is Suge) or if you just like to troll the majority of us in society who’d rather not ride with assholes. With likely one more match left in his career, lets hope that Money gets the message and leaves us as an active competitor. He can do all the promoting and attention-grabbing stunts outside of playing up his own ultimately-unsatisfying bouts of pugilism that he’d like, he just can’t take part in a two-week stretch like this past one anymore — playing coy when asked about his brutal history outside the ring, leveraging the access of journalists who have only done their jobs in asking him fair questions about that brutal history, calling on Jamie Foxx to sing the National Anthem…smh. Not that Manny was such a hero himself — he just didn’t seem to be really into this whole “fighting” thing with Floyd. Maybe he was worn down by the whole process to get to Saturday night, maybe he’s too religious a man at this point to really have the killer instinct a man in his position needed to thrive…yes, apparently Pacquiao had to deal with a key shoulder issue but he seemed like a man without a care when taking selfies with Freddie Roach and Jimmy Kimmel. Pacquiao didn’t show up against Mayweather — maybe at some point in his career, the point where he went head-up fearlessly with Mexican legends and won titles in every weight class short of middleweight, he could have but its highly unlikely that Pacman at his best would have had anywhere near the accurate punching power and counter-punching speed needed to overwhelm a boxer like “Money” Mayweather. 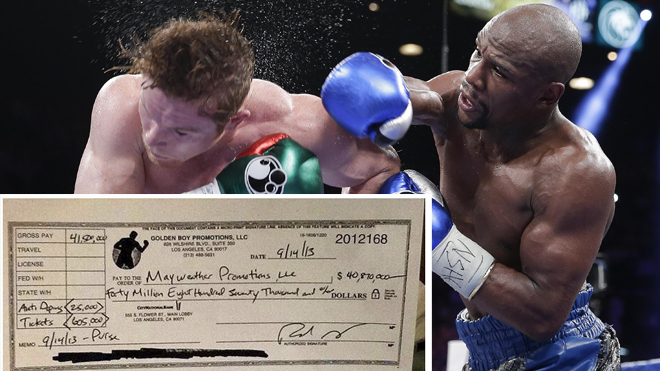 The paychecks have certainly been mighty for Floyd, if not the competition. Surely, Mayweather has fought many men who could hurt him, but there’s just been some sort of disconnect involved in the playing out of his fights. Could he just be such a genius that he knows how to counteract and defend any and all ways opponents could touch him? Could he be such a keen observer of boxing styles that he can always be confident in picking out who he should fight and when he should fight them, allowing himself to maximize his already well-held advantages in pure fighting skills? Could be all those things. Some observers are more blunt in stating that Mayweather only takes on the most winnable fights in his life, in doing so alluding to his past (at least for now) penchant for picking fights with the women in his life. To hear of some of the details in his past violent domestic encounters (particularly the Josie Harris incident) it does cause one to think, especially one who’s watched the last dozen or so Mayweather fights start to finish as this writer has, has he at any point stepped into the ring with the same kind of expressed intent to intimidate and punish as he did the night he decided to check Harris over text messages she exchanged with the NBA player C.J. Watson. From what we’ve known of Mayweather, the business man, it would seem unlikely he’s had the same scorn for Pacquiao, Canelo Alvarez or Robert Guerrero. In his role with them he was not an ex scorned, a man taking on an assumed disrespect, a bully with a chance to define a permanent role of sole provider and lord of mind, body and soul. He’s taken on that posture in checking a wayward lover, I think we’d rather he use that bile and determination to fight a more worthy physical challenger. Against Pacquiao, Alvarez and Guerrero and the like Mayweather was just a boxer, or a hustler, doing what he knew he was preternaturally gifted in in order to gain and uphold an untold level of wealth and influence, something truly amazing to behold, much like right jab-feint-left hook combo done in an instant. It’s clear that boxing fans have had the pleasure of observing a great talent in the time of Floyd Mayweather Jr. but sort of suitably his run has been so drenched in decadence, treachery and abuse of power that it makes sense that he’ll be the last boxer a majority of Americans really give a damn about. Mayweather’s is a sporting career that would feel at home in the fall of Rome. Doing fight weekend right…and doing it all the way wrong <– (you’re in paradise and this is what you choose to do? If Heaven had a ghetto that section been burnt to dust). Somebody taught Axel Rose how to use Twitter and he put out some strong opinions about there needing to be a “free-match” to make out for Saturday’s disappointment <– (will there be a free album to make up for Chinese Democracy, Axel?). Grantland put feet on the ground in Vegas and Manila while Yahoo!’s Dan Wetzel takes the unpopular (but true) opinion that Mayweather was brilliant Saturday and more than anything his sustained brilliance is the reason why he’s arguably the most successful boxer ever. LATE: Mad I almost forgot the most enjoyable element of this fight weekend — the Uncle Denzel meme. This was one of those moments where internet consciousness took on a new level of trollery and in which we are actually all the better for it. Now, no matter how bad you feel, you’re only one Google search of “Denzel bluetooth” from feeling like a new person.